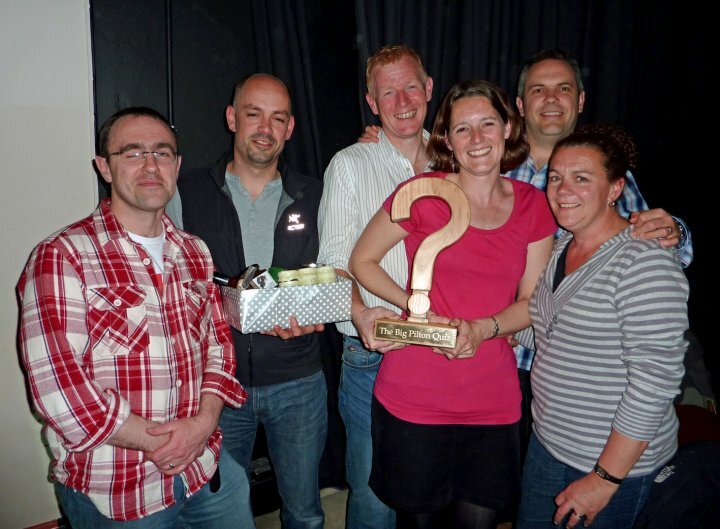 The 2012 Big Pilton Quiz for the beautiful carved wooden question mark trophy made by Mike Taffinder and first awarded in 2011 was won by 'The Professionals' in Pilton Church Hall on Saturday 5th May. The team, left to right Mark Cartmell, Ian Snowden, Derrick Brett, Kirsty Brett, Andy Steele and Karen Steele, was victorious in a closely fought quiz with 20 teams of six to raise nearly £600 for improvements to Pilton Church Hall. On top of its day to day use for Pre-School, Dance Academy, Scouts, Guides and Brownies, a Parent and Toddler Group, Friendship Circle and Tuesday Drop-Ins, the start of the monthly Pilton Cinema and events like the annual Gig Club Race and Quiz Nights, and Stars in Your Eyes, the Hall is becoming an increasingly important centre for community gatherings in Pilton.